Ph.D. in physics from Massachusetts Institute of Technology (MIT), 1937. Instructor, Assistant Professor, and Associate Professor of Physics at University of Pennsylvania, 1940-1947; Acting Chair of the Physics Department, 1942-1945. Professor of Physics at Stanford University, 1947-1970; Head of the Physics Department, 1948-1966. March 29, 1915Birth, Fall River (Mass.). 1933Received B.E., the Ohio State University, Columbus (Ohio). 1934Received M.S., the Ohio State University, Columbus (Ohio). 1937Received Ph.D. in Physics, Massachusetts Institute of Technology (MIT), Cambridge (Mass.). 1937 – 1938National Research Council (NRC) Fellow, University of California, Berkeley and California Institute of Technology. 1938 – 1940Research Associate in Physics, University of California, Berkeley. 1940 – 1947Instructor (1940-1942); Assistant Professor of Physics (1942-1944); Acting Chair, Department of Physics (1942-1945); and Associate Professor of Physics (1944-1947), University of Pennsylvania, Philadelphia (Pa.). 1941 – 1945National Defense Research Committee (NDRC) Researcher, Columbia University. 1943 – 1944Researcher, University of California, Berkeley. 1943 – 1945Consultant, Operations Research Group, U.S. Navy. 1944 – 1971Associate Professor of Physics (1944-1947); Professor of Physics (1948-1971); and Executive Head, Department of Physics (1948-1966), Stanford University, Stanford (Calif.). 1945 – 1946Researcher, Los Alamos Laboratory, Manhattan Project. 1955 – 1965Chair, Physics Advisory Committee, Office of Scientific Research, U.S. Air Force. 1956 – 1957Visiting Professor and Guggenheim Fellow, University of Paris. 1957Member, National Academy of Sciences. 1961 – 1966Member (1961-1966) and Chair (1965-1966), Physical Sciences Program Committee, Alfred P. Sloan Foundation. 1967 – 1968Chair, Division of Nuclear Physics, American Physical Society (APS). Theoretical nuclear physicist and quantum mechanist. Advised by Schiff at Stanford University on quantum theory. Ph.D. advisor at Massachusetts Institute of Technology (MIT) on quantum theory. Advised by Schiff at University of Pennsylvania on quantum theory. Advised by Schiff at Stanford University on relativity and gravitational theory. Both employed at California Institute of Technology and University of California, Berkeley. Researcher at Los Alamos Laboratory. Fellow at University of California, Berkeley and California Institute of Technology. Associate Professor of Physics; Professor of Physics; and Executive Head of department. Visiting Professor and Guggenheim Fellow. National Research Council (NRC) Fellow; Research Associate in Physics; and Researcher. Instructor; Assistant Professor of Physics; Acting Chair, Department of Physics; and Associate Professor of Physics. Member and Chair, Physical Sciences Program Committee. Chair, Division of Nuclear Physics. Received B.E. in 1933 and M.S. in 1934. 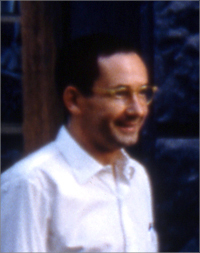 Leonard I. Schiff papers, 1948-1971. Leonard I. Schiff Physics Today obituary.